Billboard in foreground is at legal height and size limit, but ones enlarged up to the size and height of background sign could be legalized under "adjustment" provision of new sign ordinance. L.A. billboards that seriously violate conditions of their permits could be legalized under the latest draft of a new citywide sign ordinance now being debated by a city council committee. At least 500 billboards that are larger and taller than allowed could be affected, according to a report from the city Planning Department. The latest of three draft sign ordinances gives zoning administrators the authority to grant “adjustments” for billboards that deviate up to 20% from the height and sign area specified by their permits. The provision would apply to billboards erected before the city’s 2002 ban on new off-site signs, and public notice and hearing procedures would have to be followed. By way of illustration, a full-sized billboard is 672 sq. ft. and limited by code to a height of 42 ft. A 20% deviation would allow the billboard to be 806 sq. ft. and just over 50 ft. high, which would obviously have a significant effect on visibility and visual impact. Most of the city’s billboards are owned by Clear Channel, CBS Outdoor, and Lamar Advertising, which together with two smaller companies spent $595,000 lobbying city officials in the first three quarters of 2011, according to reports filed with the City Ethics Commission. The biggest spender by far was Clear Channel, with a reported $338,000 in lobbying expenditures. 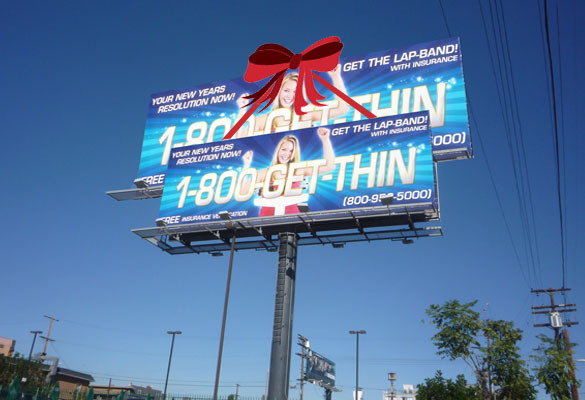 One of many provisions in a 2006 lawsuit settlement the city made with Clear Channel and CBS Outdoor allowed billboards out of compliance with their permits to remain if they were no more than 10 ft. higher, nor 10% larger than the specified dimensions. A Superior Court judge ruled in 2009 that the entire settlement was unlawful, and an appeal by the billboard companies is now pending. That lawsuit settlement also resolved a fee dispute that had long stalled a citywide inventory and inspection of billboards that had been approved by the City Council in 2002. Called the Off-site Sign Periodic Inspection Program, the inventory was to provide a publicly-accessible database showing the location of all off-site signs, and whether they had permits and were in compliance with their permits. Finally started late in 2008, the results of that program have never been made public, and officials with the city’s Department of Building and Safety have made conflicting statements about the reasons why, and whether or not the inventory has actually been completed. In the report accompanying the latest draft of the sign ordinance, city planners refer to building department “estimates” of 6,000 off-site signs in the city, with “roughly 500” having no permits on record and another 500 no longer conforming to their originally issued permits. At a city council committee meeting last year, a building department official said that there were approximately 6,300 off-site sign structures in the city, but because many billboards are double-sided the total number of sign faces was about 9,000. The City Council’s Planning and Land Use Management (PLUM) committee is expected to take up the sign ordinance early next month. In the citywide elections this past March, PLUM committee member Jose Huizar got $12,000 worth of free billboard advertising from CBS Outdoor, according to Ethics Commission records. Lamar Advertising reported giving Huizar and a second member, Paul Krekorian, free billboard advertising worth $500 in support of each councilmember’s re-election campaign.